Red Mountain, an abandoned California magnesite mine, is providing geoscientists new insights on how to permanently entomb greenhouse gas emissions in the Earth. The Red Mountain mine is about 70 miles east of the campus and contains some of the world's largest veins of pure magnesium carbonate, or magnesite – a chalky mineral made of carbon dioxide (CO2) and magnesium. How the magnesite veins formed millions of years ago has long been a puzzle but the scientists have an idea for converting CO2, a potent greenhouse gas, into solid magnesite. "Conventional geological storage involves capturing CO2 from industrial smokestacks and injecting it as a fluid into the subsurface," said Kate Maher, an assistant professor of geological and environmental sciences at Stanford. "But there is concern that the carbon dioxide would eventually leak back into the atmosphere. Our idea is to permanently lock up the CO2 by converting it into a stable mineral." Power plants and other industries are responsible for more than 60 percent of global CO2 emissions, according to the International Energy Agency . Sequestering the CO2 in magnesite deposits would prevent the gas from entering the atmosphere and warming the planet, Maher explained. Magnesite was used in the early 20th century for iron smelting and manufacturing cement. The Red Mountain mine operated for about 50 years until the late 1940s. At Red Mountain, the Stanford team has identified more than 20 large veins of pure magnesite embedded in magnesium-rich ultramafic rock. The biggest vein is about 118 feet (36 meters) wide and 886 feet (270 meters) long. More than 50 percent of the magnesite in each vein consists of CO2, the rest is magnesium. Ultramafic rocks make up about 1 percent of the Earth's surface and occur near regions undergoing rapid population and industrial growth, Maher said. More than 50 other deposits of exceptionally high-grade magnesite are distributed in the California Coast Ranges alone. Sequestering CO2 emissions at these sites could play a significant role in curbing global warming, she added. "We've been looking at the geologic structure and veining at Red Mountain to try and understand how hard ultramafic rock could be transformed into magnesite," Maher said. "One million metric tons of magnesite is the equivalent of sequestering 140,000 metric tons of carbon in mineral form," said graduate student Pablo Garcia del Real. "Our goal is to use the vast reservoirs of magnesium stored in ultramafic rocks to chemically bind with CO2 and form magnesite. But as we discovered at Red Mountain, breaking those rocks is one of the main engineering challenges that we face." "To unlock the secrets of these deposits, we needed to find clues about both the mineralization process and the geologic history of the area," del Real said. California's infamous San Andreas fault lies less than 40 miles west of Red Mountain. The fault formed about 29 million years ago, creating a large gap between the Earth's crust and the hot mantle below. The gap allowed heat to rise to the surface, raising the temperature of the water and liquid CO2 trapped in the ultramafic rocks. "When the temperature of a liquid increases, the volume increases," del Real said. "We think that the CO2 enhanced the ability of the water to expand, adding enough pressure to break the ultramafic rock and cause the chemical reaction that formed the magnesite veins." "The magnesite veins are very white, homogenous and composed of very tiny crystals, so they probably formed quickly, perhaps instantaneously," del Real explained. "The ultramafic rocks appear shattered and broken, which means that this was a violent event." 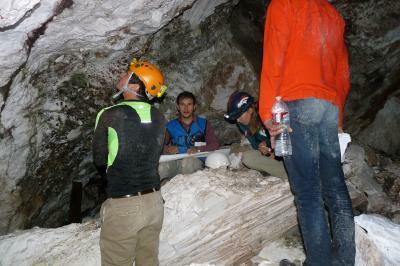 Back at the lab, the Stanford scientists conducted an isotopic analysis of the magnesite samples collected at the mine. The results suggest that when the San Andreas fault opened, magnesite formed 1 kilometer below the surface as temperatures rose from about 53 degrees Fahrenheit (12 degrees Celsius) to 86 F (30 C). Such low temperatures should make it relatively easy for scientists to convert atmospheric CO2 into pure magnesite. But del Real and his colleagues have yet to replicate the process experimentally. "If we inject CO2 from a power plant or other point source into ultramafic rock, we would expect it to form magnesite," he said. "But when we try to make magnesite in the laboratory at low temperatures, it fails to form." For carbon sequestration to succeed, scientists will also have to figure out a way to make ultramafic rock permeable. "There is no way that CO2 or anything else will flow through these rocks," del Real said. He will discuss the problem of permeability at the AGU meeting on Dec. 10 at 10:20 a.m. PT in Moscone Center South, room 301. "In our research, we combine a big tectonics approach with the minute thermodynamic behavior of fluids," del Real said. "So we go from the very large scale to the very small scale."